Edgar Rice Burroughs is best known for his "Tarzan" and "Barsoom" novels, but they're far from the only successes he had as a writer. 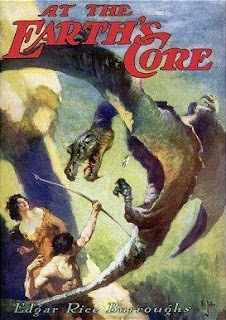 He also wrote another series of novels, beginning with 1914's At the Earth's Core. The novel tells the story of a man who discovers a subterranean realm known as Pellucidar, which exists at the interior of the world. There he encounters prehistoric beasts, such as dinosaurs, as well as primitive humans who have been enslaved by a race of intelligent flying reptiles known as Mahars. Like John Carter, the arrival of the novel's protagonist, David Innes, signals the dawn of a new era. Moved by the plight of the humans -- and enraptured by the lovely Dian the Beautiful -- Innes leads them in a revolt against the Mahars and helps them to win their freedom. Along the way, he also wins the love of Dian, who'd previously rebuffed him, due to his misunderstanding the culture of the humans of Pellucidar. Unfortunately, in their attempt to return to the surface, Innes loses Dian and vows to return to find her once more, thus setting up for the novel's immediate sequel, as well as five more, one of which was published posthumously. Arthur Conan Doyle's The Lost World predates At the Earth's Core by two years, firmly establishing the literary genre that shares its name (although several other books from the 19th century predate it and are arguably the first in the genre). Pellucidar was clearly influenced by its predecessor, but is written in a much more breezy and adventuresome style, as one would expect from the creator of Tarzan. For me, it's a much better model for pulp fantasy games than is Doyle's work, which has a vaguely "serious" tone to it, which probably explains why Gygax includes Burroughs in Appendix N and not Doyle. As an aside, the young H.P. Lovecraft was very fond of Burroughs' stories, including the Pellucidar series, though he distanced himself from them in later life, calling Burroughs a hack. Nevertheless, some claim they hear echoes of Burroughs in the name "shoggoth," which is remarkably like that of "sagoth," the ape-like race that serves the Mahar. I'm not certain how much to make of such claims but it's interesting nonetheless. I'd never heard of that last bit. On an entirely unrelated note, I love the name "Pellucidar". It makes your mouth feel good to say it. Also, it's just strange enough to feel fantastic while still sounding like it could be the name of a real place. Would just like to say that I went out of my way to locate a copy of the Peter Cushing movie on DVD and buy it a couple months back...reason being that I remember seeing it as a very young child and the images had stayed with me for about 30 years. When I finally watched it, campy though it was, the images were the same as I remember them. Even though the film is a much truncated version of the book, there is some primal stuff going on there...I can see how Burrough's writing could be inspirational, "breezy" though it might be. i think george lucas plundered burroughs even more; from the rescue the princess storyline and wholesale borrowing of words . . . I love the lost world genre. I consider H. Rider Haggard's King Solomon's Mines (1885) to be the founding work in the genre. J Allen St John did that cover. He did many covers for pulp magazines featuring Burroughs. It just occured to me to make a demi-god/patron saint of art for Greyhawk I'll call Sayntjhon. I think The Land That Time Forgot and The People That Time Forgot and Out of Time's Abyss (The Caspak Trilogy) are more properly followers in the The Lost World tradition, but maybe that's just nitpicky. As much as I love Burroughs, and as much as I love dinosaurs, Pellucidar never quite hit it off with me. The setting always felt too scattershot; like Burroughs just threw in everything and anything without regard to how it could possibly actually fit together.